Protect fair and sensitive skin with the La Roche-Posay Anthelios Anti-Shine SPF50+; a dry-touch gel cream that offers optimal sun protection and a shine-free, matte finish. The effective formula utilises a patented photostable filtering system called Mexoplex, which offers superior UVA protection and prevents skin from sun damage. 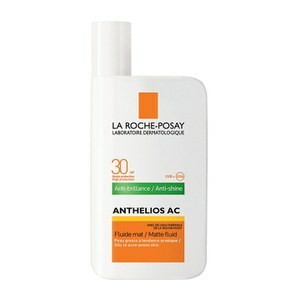 Effortlessly melting into the face, the sun cream absorbs instantly for an ultra-dry finish that is free from shine. The water-resistant formula is suitable for all skin types and is particularly beneficial for those with sensitive, intolerant and combination to oily skin. Free from Parabens. Non-comedogenic. Dermatologically tested. Aqua/Water, Homosalate, CI 77891 / Titanium Dioxide, Silica, Ethylhexyl Salicylate, Ethylhexyl Riazone, C12-15 Alkyl Benzoate, BIS-Ethylhexyloxyphenol Methoxyphenyl Triazine, Drometrizole Trisiloxane, Butyl Methoxydibenzoylmethane, Octocrylene, Styrene/Acrylates Copolymer, Titanium Dioxide [Nano] / Titanium Dioxide, Aluminum Starch Octenylsuccinate, C1 77491, C1 77492, C1 77499 / Iron Oxides, Potassium Cetyl Phosphate, Methylene BIS-Benzotriazolyl Tetramethylbutyphenol [Nano] // Methylene Bis-Benzotriazolyl Tetramethylbutylphenol, Propylene Glycol, Caprylyl Methicone, Pentylene Glycol, Acrylates/C10-30 Alkyl Acrylate Crosspolymer, Aluminum Hydroxide, Butylene Glycol, Caprylyl Glycol, Dimethicone, Disodium EDTA, Glycerin, Inulin Lauryl Carbamate, PEG-8 Laurate, Phenoxyethanol Acid, Stearyl Alcohol, Terephthalylidene Triethanolamine, Xanthan Gum, Parfum/Fragrance, (Code F.I.L: C18293/1). Please check back of pack for up to date ingredients. Finally caved in and bought this very hyped product. It is a very dry, thick consistency, which means it doesn't spread and can be quite difficult to rub into your face. I can see how this will cause "white cast" problems for some people, because you kind of have to pat it into the skin, and it is very thick. You will need at least 3-4 pumps to cover your face, so I imagine this small tube won't last long. However, it really does set very quickly completely matte. I have worn this all day and it has helped kept shine under control. I have combination skin. This may be a little drying for normal skin, or drier combination skin. It wears well under makeup. My skin is sensitive, and I have not had any issues with irritation, burning, nor has it stung my eyes, like other suncreams. 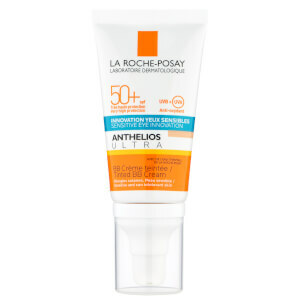 The thick consistency means you really can't apply this too thinly to get good sun protection, and it stays in place throughout the day, so I think this works particularly well if you are prone to burning or want full SPF50 protection in the Summer, but in the Winter, this is probably overkill for most people given the levels of UV in the UK. I'll probably buy again, but given the price and difficulty of application, I'll probably use something like Etude House on a daily basis, and keep this for intensive, full sun days. I suffer from sun allergy and get very blotchy face as soon as the sun comes out. 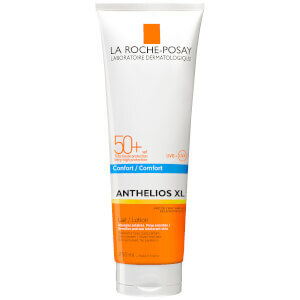 I tried so many sun creams but this one is the best so far. It is non-parfumed and anti-shine which I really like. Can't recommend it highly enough. I can only hope La Roche won't stop making it. It's really good for oily skin. Wherever it goes, it's dull. I was looking for something I could wear on top of my non-SPF moisturiser. This turned out being a lightweight sunscreen that doesn't smell like sunscreen, and doesn't make my oily face shine more than it already does. Very wearable, sits very well under my make-up, and quite affordable. Satisfied with the purchase.